Four iconic acts will appear on the smoothest line-up of the year at The O2 on September 7th, in what will be THE key date in the calendar for funk and soul fans, the inaugural Electric Soul Festival. 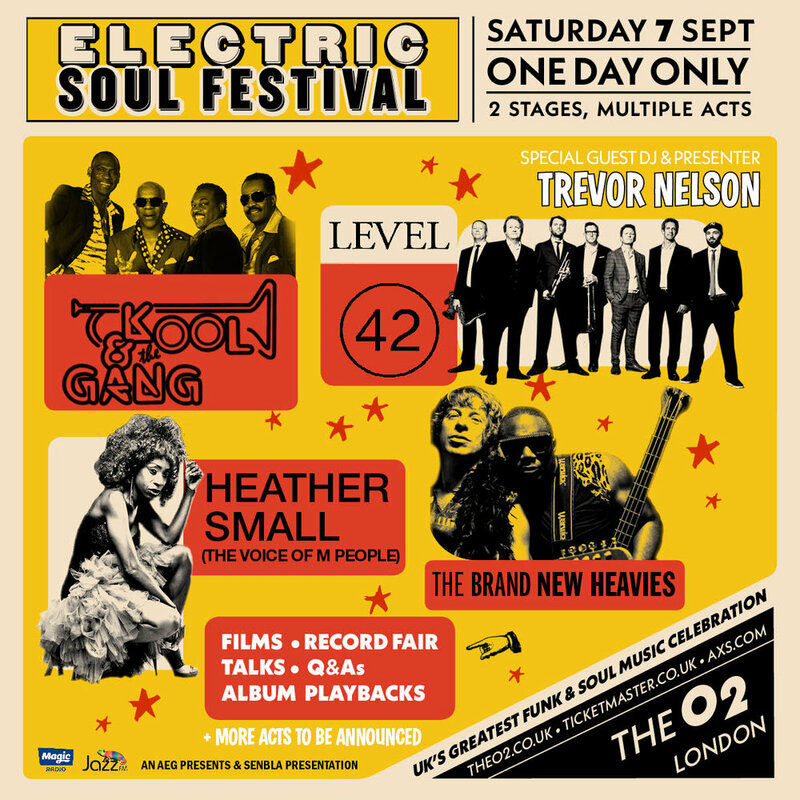 This one day only festival for soul brothers and sisters across the UK, hosted by legendary DJ Trevor Nelson, will feature three of the biggest ever bastions of British bass music, Level 42, Heather Small, and The Brand New Heavies, plus direct from the USA, post-Disco hitmakers Kool & The Gang, with further acoustic acts to be announced. Commenting on the new festival Trevor Nelson said, “I’m unbelievably excited to host the first ever Electric Soul Festival. We have massive day festivals for every other type of genre, so it’s about time we had one for funk and soul – the most influential and, obviously, my personal favourite kind of music! Between them, these artists have shaped popular music across the globe - inspiring new genres, selling millions of records, wining Grammy Awards and providing the soundtrack to so many. A one-stop shop for soundsystem supremo’s, this is the biggest line-up for lovers of smooth soul and frivolous funk grooves nationwide. Celebrating 50 years in music having formed in 1969, Kool & The Gang have earned an incredible two Grammy Awards, seven American Music Awards, 25 Top Ten R&B hits, nine Top Ten Pop hits and 31 gold and platinum albums, with seminal hits like ‘Celebration’, ‘Cherish’, ‘Jungle Boogie’, ‘Summer Madness’, and ‘Open Sesame’. Led by slap-bass-supremo and frontman Mark King, Level 42 have had 18 top 40 singles, including ‘Lessons in Love’, ‘Something About You’, ‘Leaving Me Now’, ‘Running in the Family’, and ‘Hot Water’, and sold in excess of 30 million albums worldwide. Commenting on the Electric Soul Festival, Mark said, “I’m thrilled that Level 42 will be a part of this amazing day at The O2, and I know the vibe in there will be off the scale! So Soul Sisters and Brothers, get your glad -rags on, and let’s party hard”. With the group M People, Heather Small became one of the seminal British voices of the 1990s, winning the Best British Dance Act Award at the BRITs in 1994 and 1995, as well as the Mercury Music Prize for seminal album Elegant Slumming in 1994. At Electric Soul Festival, Heather will perform much-loved hits such as ‘Moving On Up’, ‘One Night In Heaven’ and ‘Search For The Hero’; as well as her successful solo career including her single ‘Proud’ which soundtracked a whole host of special events as part of the London 2012 Olympics bid. Translating their love for 70’s Funk grooves into a sophisticated Soul sound, The Brand New Heavies have been responsible for an incredible 16 Top 40 singles, including ‘Dream On Dreamer’ and ‘You’ve Got A Friend’, as well as over two million albums sold across their two decade career. Pioneering London’s Acid Jazz scene, The Brand New Heavies are a live tour de force.